it was the structure of Anne Griffin’s When All is Said that first caught my eye and when I realised she’d been a bookseller with Waterstones it went straight on my list. John Boyne’s name sits proudly on the back of my proof under a glowing puff, another Waterstones alumni. Spanning a single night, most of which is spent in the bar of the Rainsford House Hotel, Griffin’s debut tells the story of eighty-four-year-old Maurice Hannigan as he makes five toasts. Widowed two years ago, Maurice has decided he can no longer bear to be without his beloved Sadie. He’s put his affairs in order, dressed himself smartly and settled in at the bar. Over the course of the evening he raises his glass five times: once to his beloved brother Tony, long ago lost to tuberculosis; once to his longed for daughter, Molly, who arrived stillborn; once to his sister-in-law, Noreen, a constant presence in his and Sadie’s life; once to his son Kevin, openly adored by his mother but barely acknowledged by Maurice and lastly to Sadie, much missed but so often overlooked. As Maurice drinks each toast, kindling memories of these five, we learn how his life became intertwined with the Dollards whose farm he went to work on aged ten, now the hotel in which he sits, and the far-reaching repercussions of small split-second decision. Maurice addresses his thoughts to Kevin, confessing his many misdemeanours, not least his inability to express his love and admiration for the son who makes his living from words while his father can barely read. Maurice has made himself one of the wealthiest men in the county but he’s neglected those dearest to him and his vengefulness towards the Dollards has caused them a great deal of misery. Now that he’s sealed his own fate, it might be time for a little redemption. This is such a clever structure. Griffin tells us story of Maurice’s life through his recollections of the people most important to him, and to some extent the story of rural Ireland over the past century along with it. He’s an expertly drawn character, every inch the jovial old man at first but soon revealing both the sadnesses that have shadowed his life and his inability to open himself to love and joy, his eye fixed on accumulating property and the righting of the wrongs done to his family by the Dollards. Maurice is the master of the colourfully turned phrase, captured well in Griffin’s use of vernacular. His cocky exterior hides a well of grief and not a little guilt but there’s a good deal of comedy amongst the tragedy. A thoroughly enjoyable, smartly turned out piece of fiction inspired, apparently, by a man Griffin met in a hotel who told her he’d worked there as a boy and wouldn’t see the morning. This entry was posted in Reviews and tagged Anne Griffin, Irish fiction, Sceptre Books, When All is Said on 25 January 2019 by Susan Osborne. Regular readers may have noticed I’ve a weakness for Irish writing. It was that and the premise of Billy O’Callaghan’s My Coney Island Baby that attracted me to it. Two lovers, engaged in a long affair, meet for an afternoon once a month, a welcome interval in their humdrum marriages. Now each is faced with a crisis that threatens this relationship which has become so precious to them both. On a bleak November afternoon, Michael and Caitlin battle their way against the wind to a Coney Island hotel. They’ve snatched afternoons like this for twenty-five years since Michael met Caitlin in a bar, escaping the awful grief at the loss of his baby son. Caitlin was already married, still cherishing dreams of becoming a writer and publishing the occasional short story. These two clicked and have continued to do so, telling each other their stories as lust dwindles a little, although never completely, and love grows. Now they’re in their late forties and age is overtaking them. Shortly after they meet, Michael tells Caitlin that his wife has been diagnosed with terminal cancer. Later in the afternoon she tells him her husband is in line for a promotion that will take him to Illinois. They both know these monthly meetings may be about to end unless they make an irrevocable decision. For those seconds of a summer’s afternoon, easy in one another’s arms, they were entirely who they wanted and needed to be. O’Callaghan’s novel takes place during a single afternoon, switching perspective from Michael to Caitlin. Their stories unfold in such a way that we come to know these two intimately: Michael thinks of the Irish island he left when he was sixteen, and his son whose death indelibly marked his marriage; Caitlin remembers her ambitions to become a writer, and the stepfather whose sudden departure left her and her mother alone again. There’s an elegiac tone to O’Callaghan’s prose coupled with a timelessness which suits his subject beautifully. It’s a novel that quietly draws you in, engaging sympathy for these two lovers who face the end of the only relationship in which they’ve truly felt themselves. This entry was posted in Reviews and tagged Billy O'Callaghan, Irish fiction, Jonathan Cape, My Coney Island Baby on 18 January 2019 by Susan Osborne. The heading for this post could just as easily be 10, 15 or even 50 Irish books I’ve read. So much of the quietly elegant, understated writing I admire turns out to be by Irish authors. Their work is often tinged with more than a little melancholy, perhaps only to be expected given their country’s history. Below are five of the best Irish books I’ve read, just one with a link to a full review on this blog. William Trevor’s The Story of Lucy Gault begins in the troubled year of 1921. Three men appear in the grounds of Lahardane to burn the house down. Springing to the defence of his English wife and their daughter, Lahardane’s Protestant owner Everard Gault fires his shotgun meaning only to frighten the trespassers but wounding one of them. The young man’s family will have nothing of Everard’s pleas for forgiveness. For their own safety, the Gaults must leave Ireland, an idea that eight-year-old Lucy finds unbearable. She runs away, determined to make her mother and father stay. Believing Lucy to be dead, her heartbroken parents turn their backs on their beloved home. When Lucy is found alive, they can’t be traced and her life becomes one of atonement for the wrong she feels she’s done them. Infused with an aching sadness, The Story of Lucy Gault typifies Trevor’s novels: slim, elegant, often spare, each word carefully chosen. John McGahern’s That They May Face the Rising Sun is a little cheerier, unlike much of his fiction. Leaving their bustling London life behind, Joe and Kate Ruttledge have settled in a small Irish lakeside community on a farm subsidised by Joe’s writing. The small dramas and quiet satisfactions of everyday life fill their world: visits from their neighbour and dear friend the incorrigibly inquisitive Jamesie; lambing and selling their calves at the cattle mart; trips to town to pick up supplies and local news. This gentle, almost wistful, novel traces a year in the Ruttledges’ lives, capturing both place and time beautifully. The quiet restraint that characterises much of McGahern’s writing is a delicate counterpoint to the sometimes lyrical sentences that bejewel his work. I was going to pick a different Colm Tóibin novel from Brooklyn which has received so much exposure thanks to the excellent film adaptation but it’s my favourite of his and I kept coming back to it. Unable to find work in 1950s Ireland, Eilas Lacey emigrates having heard of the many employment opportunities on offer in New York. She gets a job in a department store, takes up evening classes and tries to keep her desperate homesickness at bay. Shortly after she becomes involved with Tony Fiorello, she’s summoned back to Ireland by news of a family tragedy, hastily agreeing to a secret marriage before she leaves. At home, egged on by her mother, she finds herself falling in love with Jim Farrell, ignoring Tony’s letters and telling no one about him. The Irish American world is a small one, however, and it’s soon clear that Eilas must make a choice. Written in Tóibin’s spare yet eloquent prose, Brooklyn is a triumph, one which I didn’t expect to be matched by the film until I saw Saoirse Ronan as Eilas. She seemed born for the part. Deirdre Madden’s Molly Fox’s Birthday takes place during the space of one day, as you might expect from its title, but it encapsulates decades of memories as a successful Northern Irish playwright thinks of her friend Molly whose Dublin house she has borrowed while Molly is in New York. Molly is a celebrated actress, feted for her stage performances. As our unnamed narrator struggles with writer’s block she remembers shared times with Molly, her thoughts often returning to their mutual friend Andrew. We know it’s Molly’s birthday from the book’s title but the full significance of the date slowly becomes apparent as our narrator muses on writing, friendship and identity, while wondering why Molly never celebrates her birthday. Madden’s writing is beautifully honed, as elegantly understated as all three of the previous writers. Belinda McKeon’s Tender begins in 1997 and ends in 2012, three years before the resounding referendum vote in favour of equal marriage in Ireland. Catherine and James instantly click when James returns from Berlin to reclaim the room Catherine has been renting for her first year at Trinity. He’s tactile and outgoing, loudly pontificating on everything and everybody yet tender-hearted, while she’s self-conscious, buttoned-up and naïve. Before too long everyone is convinced they’re a couple but eventually James tells Catherine he’s gay. Soon she begins to bask in the glamour of this new sophisticated status, spilling the beans to those James has not yet told with unhappy results. Tender is a profoundly involving novel – raw yet compassionate, and extraordinarily intense at times. Another Irish triumph. Any books by Irish authors you’d like to recommend? This entry was posted in Five Books I've Read, Reviews and tagged Belinda McKeon, Brooklyn, Colm Tóibin, Deirdre Madden, Irish fiction, John McGahern, Molly Fox's Birthday, Tender, That They May Face the Rising Sun, The Story of Lucy Gault, William Trevor on 28 December 2018 by Susan Osborne. This seems to be the year of the novella for me helped along by Madame Bibi who devoted the whole of last month to the form. Set in a small Irish town, Rebecca O’Connor’s He Is Mine and I Have No Other may be short on pages but it’s devastating in its revelation of tragedy, secrets and lies as it tells the story of fifteen-year-old Lani who falls in love with a troubled boy. Lani lives with her mother, father and grandmother in a house on the edge of town. Every day she watches a boy make his way to the graveyard just above their house where thirty-five orphan girls lie buried, conceiving a passion for him and persuading her best friend to go with her to his school disco. They concoct an alibi for parental consumption, pilfer a few cans and take themselves off – Lani determined to ask the boy to dance. To her amazement he says yes and the two begin to exchange letters – his a little overwrought, hers more prosaic. Already painfully self-conscious, Lani swings from ecstatic fantasies about Leon to a conviction that she’s being laughed at until she discovers that he has a past which marks him out from other boys. Despite the happiness of her mother’s unexpected pregnancy, there are also secrets in her own home, kept tight since her grandmother was Lani’s age. Lani tells her own story, her narrative occasionally punctuated by short entries from her aunt’s book on the orphans burnt in a convent fire made poignant by their hopes for the future in amongst the neglect and abuse suffered at the hands of their supposed protectors. O’Connor lightens the tone of Lani’s story with a much-needed thread of humour – her parents call each other ‘mam’ and ‘dad’ but presumably not when the condom broke, thinks Lani, sarcastically; ’the fumes from the aftershave were deadly’ at the school disco which is excruciatingly vivid in its depiction of adolescent awkwardness as the first slow song plays. Lani views boys with deep suspicion as if they’re another species: they smelled, most of those boys. They smelled like they had dirty things on their minds. Lani’s parents’ happiness and concern for her contrast sharply with the misery of Leon’s predicament but there’s no getting away from tragedy in this novel. Prepare to have your heart well and truly wrenched. That’s it from me until nearly the end of this month. We’re taking to the railways again, leaving for London later today then catching Eurostar to Amsterdam before heading east. The aim is to travel light but no doubt space will be made for a book or three. This entry was posted in Reviews and tagged Canongate Books, He Is Mine and I Have No Other, Irish fiction, Rebecca O'Connor on 8 June 2018 by Susan Osborne. Last year Cathy from 746 Books was kind enough to ask me to take part in her Books that Built the Blogger series. She’d just kicked off Reading Ireland month and asked me for my favourite Irish novel, a tough question if ever there was one – not a case of where to start but where to stop. The one that finally topped my list was John McGahern’s That They May Face the Rising Sun which has the feel of a man who has come to terms with his troubled past, a past stitched through McGahern’s earlier, bleaker novels as his autobiography makes clear. Somehow that feels appropriate for New Year’s Day. Leaving their bustling London life behind, Joe and Kate Ruttledge have settled in a small lakeside community in Ireland. They have a farm, subsidised by Joe’s writing, and their life follows a slow, gentle rhythm, in tune with the seasons. The small dramas and quiet satisfactions of everyday life fill their world: visits from their neighbour and dear friend the incorrigibly inquisitive Jamesie, lambing and selling their calves at the cattle mart, and visits to town to pick up supplies and local news. McGahern’s gentle, almost wistful, novel traces a year in the Ruttledges’ lives, introducing perceptively drawn and wonderfully memorable characters while painting quietly restrained yet evocative word pictures of a world in which each small change delicately redistributes the balance of the whole. McGahern’s writing has a very precise character, the product of the meticulous paring down of his prose out of which the occasional lyrical sentence shines brightly. His carefully crafted novels perfectly capture both place and time. And if I haven’t convinced you to read his work perhaps Colm Tóibín’s description of McGahern as ‘the Irish novelist everyone should read’ will. This entry was posted in Blasts From the Past, Reviews and tagged Faber & Faber, Irish fiction, John McGahern, That They May Face the Rising Sun on 1 January 2018 by Susan Osborne. I have a weakness for Irish fiction. It’s often characterised by a restrained clarity – beautiful, elegant prose with a yearning quality about it – or at least the work of authors I favour fits that description. Colm Tóibin, John McGahern, William Trevor, Ann Enright, Deirdre Madden all come to mind and after reading When Light is Like Water I’ll be adding Molly McCloskey’s name to that list. This slim, quietly brilliant novel tells the story of Alice who came to Ireland from Oregon as a young woman and fell in love with an Irishman. Decades after she first arrived in Ireland, Alice is house-sitting, back from her job with an NGO at a Kenyan refugee camp. Blindsided by grief at her mother’s death, she looks back at her relationship with the woman who raised her alone and at her own brief marriage to Eddie. Alice had come to Ireland when she was twenty-four with no plan in mind, just a need to become herself. She finds a job in a Sligo pub, makes friends then falls in love with a quiet, steady man, older than herself. These two marry, seeming almost to play at it – Alice still without direction, picking up the odd freelance writing gig and keeping house. They move to the country with the possibility of children in the air but neither can quite bring themselves to commit to the idea. Eddie sometimes travels on business, occasionally Alice goes with him but one day, when he’s away, she meets Cauley, a young writer whose radio spots will offer the convenient excuse of the possibility of work for her. We know from the start that Alice and Cauley will have an affair, and that Eddie and she are no longer married. McCloskey’s novel unfolds Alice’s memories of that intense summer, interspersed with her mother’s story and her experiences of working for the NGO. When Light is Like Water is a richly textured novel about the complexities of love in its many forms. McCloskey narrates it through Alice’s quietly contemplative voice, exploring the devastation of her grief for her mother but also for the life that she might have led. Her loneliness is palpable in her frequent visits to the real estate website where she’s found the house she and Eddie made their home, playing the marketing video and noting evidence of children. McCloskey couples lovely descriptive passages with a remarkable acuity, penetrating in its observation: ‘Cauley and I were still in our trance’; ‘If we don’t know where we belong, we can feel homesick for almost anywhere we’ve been’; ’I swung between a lightness of being that bordered on vertigo and a sorrow that made the least movement difficult’. This is a deeply thought-provoking novel: multi-layered, complex and beautifully expressed. McCloskey’s writing career stretches back over a couple of decades during which she’s written a memoir and three works of fiction. I’ll be keeping my eye out for them, you can be sure. This entry was posted in Reviews and tagged Irish fiction, Molly McCloskey, Penguin Ireland, When Light is Like Water on 31 May 2017 by Susan Osborne. History, family and otherwise, is woven through the fabric of this accomplished first novel which seems appropriate given that Neil Hegarty’s previous books deal with the subject. Set in Derry against the background of the Troubles, Inch Levels is about a young man with only a few weeks to live, wrestling with a dilemma and the tortured family history that has led him to it. Barely into his thirties, Patrick Jackson has been diagnosed with an aggressive cancer. He lies in his hospital bed listening to the ringing of the bell in the nearby school where he taught, trying to stave off his pain with memories. He has much to contemplate, his reverie interrupted by the visitors he doesn’t want to see, the sometimes patronising attentions of the nurses he would rather not have to endure. Each day his mother, Sarah, or his sister, Margaret, come to visit him but it’s only Margaret who’s welcome. Patrick’s reflections are studded with vivid memories – a day with his family at the beach; a march in his hometown of Derry which ended in bloodshed; the loving attentions of Cassie the only person Sarah seemed able to trust – but the memory which haunts him is not his own: the events leading to the death of an eleven-year-old girl one autumn day in 1983. As Patrick’s recollections unfold they reveal a family whose emotions have been smothered: a mother closed off, unable to express affection; a father doing the best he can but unable to compensate and two children, confused and resentful but knowing that each is all the other has. Hegarty’s writing is often striking, particularly when describing the natural world: ‘the landscape was a palette of greens, changing with height into the deeper green-brown of bracken, purple of heather, hard silver glint of scree-strewn slopes’ vividly summons up an Irish hillside. It’s a novel which shows rather than tells, repaying close attention. Piece by piece Hegarty slowly reveals what has led Sarah into her emotional vacuum and the consequences it has had. Written in the main from Patrick’s point of view, the narrative smoothly shifts from character to character, answering questions but often prompting more. It’s adroitly done: so much is left unsaid in this family haunted by events that only one of them understands. Quietly impressive and wholly engrossing, Inch Levels is a fine debut which gently leads its readers to a resolution entirely in keeping with what’s gone before. This entry was posted in Reviews and tagged 1980s, Head of Zeus, Inch Levels, Irish fiction, Neil Hegarty, the Troubles on 28 October 2016 by Susan Osborne. The trouble with marketing is its constant use of superlatives – too much hype. We’re all over familiar with ‘dazzling debuts’, ‘stunning achievements’ and the like so that when a book comes along that is truly original, absolutely dazzling, those descriptions ring hollow. 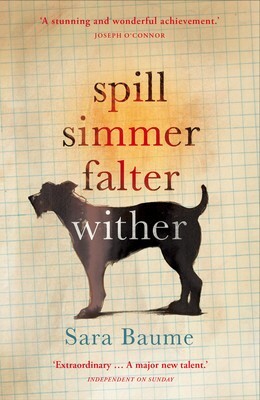 Sara Baume’s Spill Simmer Falter Wither comes into that category for me. Hard to find words that will do it justice without floundering around in a sea of hyperbole but I’ll try. Fifty-seven-year-old Ray lives alone. He’s a misfit – shambling, limping, barely able to string a sentence together in public, his greasy plait trailing down his back. On one of his weekly forays into the village where he’s lived all his life he spots a notice in the window of the local junk shop showing a dog as ugly as he thinks himself. At the dog pound he finds the terrier, bad-tempered and alone, about to face the chop. Ray’s after a ratter, a dog who will keep the infestation of rats which have plagued the house he shared with his father at bay, and takes One Eye, as he christens the disfigured mutt, home with him. Soon this odd pair are inseparable. When One Eye’s terrier nature comes out, savaging a collie then a shih tzu with a little boy in tow, the dog warden knocks at their door. Appalled at the prospect of losing the only friend he’s ever had, Ray packs up the car and drives off into an unexplored world. As these two make their way through autumn into winter until the money runs out, Ray confides his sad story in One Eye. As its title suggests, Baume’s novel is told in wonderfully poetic, sometimes musical language. She paints vividly gorgeous word pictures of the natural world, weaving observations of the changing seasons through Ray’s narrative. It’s a slim novel but I found myself pulling out quote after quote. Crabs have ‘spots and spiked edges like pinking shears’; Ray’s hairdresser neighbour’s ‘gone on holidays and taken the hum of the hood dryers with her’; ‘Oystercatchers with their startled eyes, redshanks scurrying tetchily on strawberry legs, little egrets freshly laundered, whiter than white’ populate the shoreline. ‘I’m a boulder of a man. Shabbily dressed and sketchily bearded. Steamrollered features and iron filing stubble’ thinks Ray, introducing himself to One Eye, sure that he smells ‘more must and porridge and piss, I suspect, than sugar and apples and soap’. ‘Now you are my third leg, an unlimping leg, and I am the eye you lost’ poignantly captures Ray’s relationship with his dog. He’s a ‘wonkety’ man, afraid to be with people and painfully sensitive to what they think of his strangeness. The novel ends with a wonderfully vivid epilogue which almost mirrors its gut-wrenching prologue. It’s a gorgeous book – the saddest of stories but without a hint of sentimentality. Dazzling, stunning, truly original – all those over used superlatives apply but this time they fit and I was delighted to see that Baume won the Rooney Prize for Irish Literature the other week. This entry was posted in Reviews and tagged Irish fiction, Rooney Prize for Irish Literature, Sara Baume, Spill Simmer Falter Wither, Windmill Books on 6 November 2015 by Susan Osborne. I’ve been a fan of Colum McCann’s novels since way back in the late ‘90s when I read This Side of Brightness. His fiction ranges far and wide – from Dancer’s Rudolf Nureyev to the Roma of Zoli – and his writing is often strikingly poetic. Unsurprisingly, then, I’ve been looking forward to his new book despite my self-confessed short story prejudice. It opens with the titular ‘Thirteen Ways of Looking’ – a novella, rather than a short story – followed by one very short piece then two others. All of them are powerful in their own way but you won’t be surprised to hear that ‘Thirteen Ways’ is my favourite. Widower J. Mendelssohn is eighty-two years old. He lives in an Upper East Side apartment with Sally, his Caribbean carer. Almost every day he gets himself out of bed and makes his way, with Sally’s help, to the Italian restaurant not two hundred yards from his apartment. Every day he has the same conversation with Tony the doorman, and every day the restaurant staff greet him warmly. On this particular occasion he’s meeting his son, a hedge fund manager and a disappointment to his father. There’s one other difference in today’s routine: we know very early on that this day will be his last. Mendelssohn’s narrative is interwoven with the efforts of detectives to solve his murder as they scrutinise the footage from the multitude of cameras that line his route, two of them covertly installed in the apartment by his son to keep and eye on the blameless Sally. Mendelssohn’s narrative takes the form of an internal monologue composed of memories and reflections – the challenges of ageing; his son Elliot and his shortcomings; his daughter Katya, a rebel turned diplomat; philosophical observations; memories of his legal career and speculations as to what Sally’s up to – his darling wife never far from his thoughts. The intimacy of these musings makes his death all the more shocking despite our prior knowledge of it. Punctuating Mendelssohn’s narrative are the detectives’ intricate reconstructions of the day’s events, slowly revealing the culprit. It’s a compelling piece of writing, making its readers think about the nature of guilt which may not be attributed quite as fairly as we think. As for the other three stories: ‘What Time is it Where You Are?’ is a short playful riff on the process of writing, desultory then increasingly frenetic notes hinting at the panic of a fast approaching deadline. ‘Sh’khol’ examines a very particular loss for which a translator can find no word in English but which she comes to understand all too well when her adopted thirteen-year-old son disappears, the urgency of the search evoked in plain short sentences. In ‘Treaty’ an elderly nun sees her South American torturer on television, apparently involved in peace negotiations and decides to seek her own kind of settlement thirty-seven years after her ordeal. An impressive, thought-provoking collection, then, but I’m hoping for a novel next time. 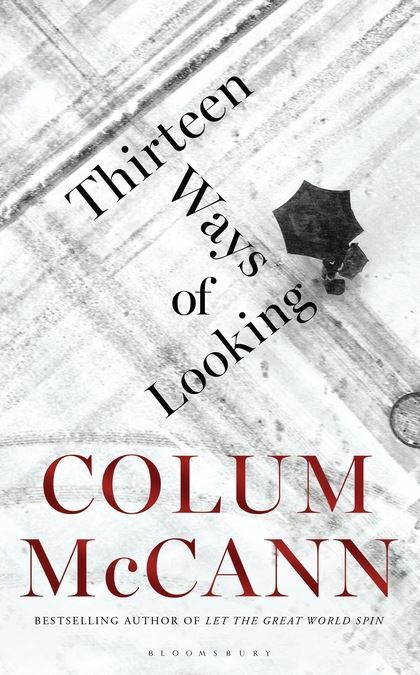 This entry was posted in Reviews and tagged Bloomsbury Books, Colum McCann, Dancer, Irish fiction, novella, Short Stories, Thirteen Ways of Looking, This Side of Brightness, Zoli on 21 October 2015 by Susan Osborne.